Grill these heart-healthy burgers, instead of burgers made from meat. Boca Burgers come in several flavors, and are made from soy, veggies, cheeses and seasonings. Protein: 14 grams per serving (one burger). The original vegetarian hot dog made from soy. They cook faster than meat-based hot dogs, and contain no cholesterol or nitrates. Protein: 7 grams per serving (one hot dog). Lunch meat sandwich alternative to meat. Available in Roast Beef, Peppered, Oven Roasted, Hickory Smoked, Bologna Style, and Italian. Protein: 13 grams per serving (5 slices). 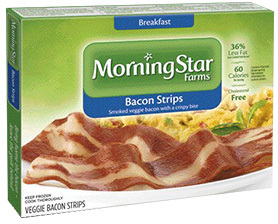 Smoky flavored strips that tastes just like bacon. Sautée to a crisp texture, and add to sandwiches or have them with your breakfast meal. Protein: 2 grams per serving (2 strips). Asian inspired entrée made from soy, wheat, grains and veggies. Serve it with rice or noodles and your favorite green veggie. 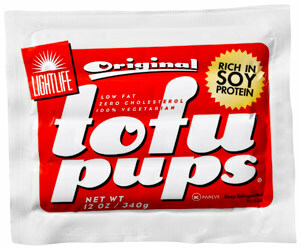 Protein: 16 grams per serving (10 pieces). 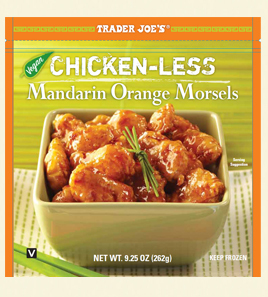 Posted on July 8, 2013, in Food, Recommended Products and tagged quick meatless meals, Trader Joe's, vegan, vegetarian. Bookmark the permalink. Leave a comment.